The great debate is finally reaching WSU. 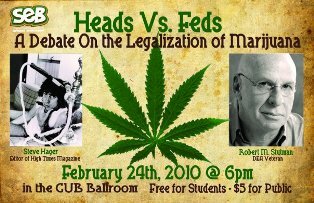 Steve Hagar, editor in cheif of High Times Magazine and Robert M. Stutman, former Drug Enforcement Administration veteran will debate the legalization of marijuana on Wednesday, February 24 in the WSU Compton Union Building Senior Ballroom. The event will be hosted by the Student Entertainment Board, one of WSU’s registered student organizations. The debate will be mediated by SEB’s Lecture’s Programmer Rachelle Rosonitz and will last about 30 mintues with discussion and rebuttals from each speaker. The debate will be followed by questions from the audience. This event is free to students with valid WSU IDs and $5 for public. Doors will open at 5pm so get there early for a good seat. For more information click here.